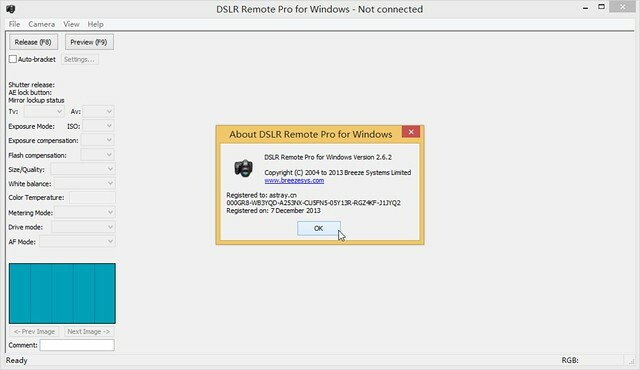 DSLR Remote Pro for Windows…The professional’s software solution for remotely controlling your Canon EOS digital SLR from a Windows PC using a FireWire or USB cable. DSLR Remote Pro for Windows now includes a complete software solution for a professional photobooth. DSLR Remote Pro for Windows supports most Canon DSLR cameras including the Canon EOS 7D, Canon EOS 6D, Canon EOS 70D, Canon EOS 60D, Canon EOS 50D, Canon EOS 5D Mark III, Canon EOS 5D Mark II, Canon EOS 100D/Rebel SL1, Canon EOS 700D/Rebel T5i, Canon EOS 650D/Rebel T4i, Canon EOS 600D/Rebel T3i, Canon EOS 550D/Rebel T2i, Canon EOS 500D/Rebel T1i, Canon EOS 1100D/Rebel T3, Canon EOS 1000D/Rebel XS, Canon EOS 450D/Rebel XSi, Canon EOS 40D, 1D X, 1D C, 1Ds Mark III, 1D Mark III and 1D Mark IV.